Some thoughts on planting seeds: where to buy them, how to care for them (including the 3 most important elements of plant care), and a tip on how to keep track of which seeds to plant when. I planted a few tomato and onion seeds in pots indoors this year. Here’s how they’re doing. Today, I’m launching a new project: Brent’s Victory Garden. It’s part how-to and part documentary on backyard gardening in the 21st century. I’ll be posting videos (one every two weeks) about planting and growing vegetables (and other plants) in my tiny backyard plot. The idea is to promote vegetable gardening for everyone–that you don’t need a farm or eight hours a week to successfully grow vegetables or otherwise maintain a small garden. I want people to feel confident that they can dig up some grass and plant a few veggies. So, here’s the first video: a quick how-to guide on growing plants from seed. I was surprised recently to overhear a co-worker complain that vegetable gardens require a lot of work. Perhaps a large vegetable garden, sure, but they don’t have to be. Vegetables are plants — you put them in good soil and water them frequently, and they grow, all other things being equal. My setup is pretty straightforward: I bought a bunch of 10-foot 2×6 boards, cut them in 6′ and 4′ sections, and constructed a 6’x4′ open-top box in my back yard, near the house. I then filled it with top-notch potting and vegetable soil. Every year, I buy seeds from Home Depot (though I’m currently looking for more local options) and spend about 30 minutes planting them. They go in simple rows. Being single, I don’t need hundreds of green beans, so I only put in half a dozen of each plant. 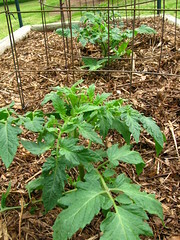 My current crop includes onions, green peppers, tomatoes, green beans, eggplants, and potatoes. That’s it. Really. No fertilizer, no hoeing, no mulch. Just harvesting the veggies once they’re ripe. Much as we’ve engineered our world into consistency—on any day of the year, you can find tomatoes in the grocery store—our planet maintains its seasonal cycle. Our kitchens may keep the same color every month of the year, but we step outside in March to a changing world. While the mornings are still chilly, the air has a warmth and vitality that we haven’t seen in months. After the long sleep of winter, Earth is taking its first wakening breaths. And so my mind turns to my garden. I have two of them, really: front and back. The front garden is a simple patchwork of flower beds and healthy shrubs. The back garden is my canvas and my laboratory. The crocuses have appeared, like shy girls at a dance, peeking up in ever-greater numbers. They are heralds of spring, and I’m craning my neck to see the rest of the season’s bright entourage. No such luck, yet. But that’s okay, because my tea plant arrived today. Camellia sinensis is the plant that all leaf teas are made from: green teas from fresh, steamed leaves; oolong teas from slightly browned leaves; and black teas from thoroughly browned and dried leaves. While this single bush won’t provide me with enough tea to entirely satisfy my daily afternoon tea cravings, the plant is a whimsical and useful addition to my garden. And a great beginning to the season. A relaxing day today. I decided to take a real Sabbath today, so I spent the morning snapping pictures of flowers at a nearby plantation, then drove out to see a friend who’s just returned from a trip to the Ukraine. Then back home to make dinner, read, and call Saalon to talk about plans for a giant robot TV series. The weather was perfect. Mid-seventies, clear blue skies, no insects. Sadly, the plantation was completely empty; nobody else wanted to enjoy a beautiful day in a beautiful garden, it seems. I can’t imagine why not. Even when I was poring over garden books, I was doing so at a table in the garden. It was too nice of a day to spend all of it indoors.